Congratulations to Pacific Northwest National Laboratory Fellow Dr. David Koppenaal, lead developer of a breakthrough technology for mass spectrometry detectors that was selected as a 2011 R&D 100 Award winner. The awards, given annually by R&D Magazine since 1963, identify and celebrate the 100 top technology products of the year. 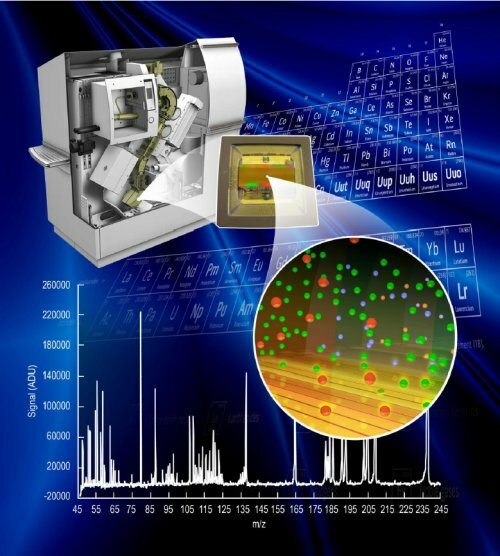 Koppenaal and the Pacific Northwest National Laboratory team collaborated with Indiana University, the University of Arizona, and California-based IMAGERLABS to develop the Array Detection Technology for mass spectrometry. PNNL senior research scientist Charles Barinaga was also named as a developer on the award. The Array Detection Technology for Mass Spectrometry employs thousands of micro-fabricated detectors arranged in a dense array and electronically integrated into a single monolithic chip-based device to simultaneously monitor and detect wide mass ranges. This allows the entire composition of a test sample to be analyzed in a single run, which saves time, increases efficiency, and considerably simplifies the analysis process. Conventional detectors have historically only been able to detect a single mass or a small range of masses at one time, meaning all other chemical information for a given analysis was lost or undetected, and multiple scans or runs were required to detect and analyze an entire chemical sample. This technology offers a significant advance in wide-range mass detection, and realizes our project motto, ‘all-the-signal, all-the-time,' Koppenaal said. "This has been a great collaborative effort involving the Lab, academia, and private industry—and the long-term support of our DOE sponsor (the Office of Defense Nuclear Nonproliferation)." The new technology is highly desirable for a number of analytical applications, some of which include nonproliferation monitoring, forensics, environmental monitoring, and industrial hygiene. It is licensed to Spectro/Ametek, who launched the first commercial implementation of the detector in a mass spectrometry instrument product in 2010. All four partners are co-recipients of the award with PNNL. This was one of two R&D 100 Awards PNNL received this year. The winners will be recognized in October in Orlando, Florida, at the awards ceremony sponsored by R&D Magazine.